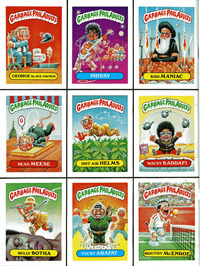 Over the years Garbage Pail Kids have popped up a number of times in print. Occasionally for promotional reasons, occasionally with featured articles, and often with a complaint from a parent. This page highlights some of the best MAGAZINE and NEWSPAPER articles. During the 80s parents LOVED to write into NEWSPAPERS to complain about Garbage Pail Kids. And sure, occasionally there was the nice puff-piece about the popular craze. Below is a gallery of newspaper articles from back in the day. So sit back, put your feet up, and browse through the GARBAGE PAIL KIDS NEWSPAPER! 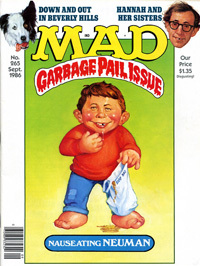 Perhaps the most famous example of Garbage Pail Kids in print was the September 1986 issue of MAD MAGAZINE. 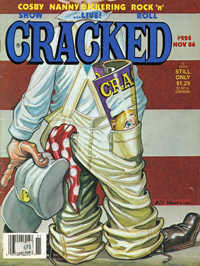 Issue #265 featured the parody of Alfred Neuman on the cover in classic GPK style. There was no mention of the cards on the inside, however the back cover did contain nine Garbage Pail Kids Adults that kids could cut ou tand trade with their friends. 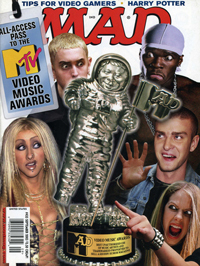 Warp ahead 17 years to September, 2003 and miraculously Garbage Pail Kids appeared in MAD again. This time (Issue #433) they were not on the cover, however one could argue this inclusion was just as sweet. To help pump the re-birth of GPK (ANS1) Topps published a 3-sticker insert that included a checklist on the back. 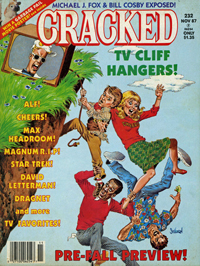 CRACKED MAGAZINE was another extremely popular magazine in the 80s, so it made sense for them to create a section based on the popularity of Garbage Pail Kids. 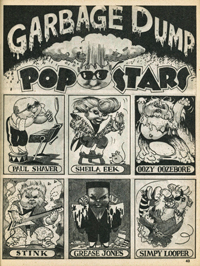 Issue #224 (released in November 1986) featured three pages of "Garbage Dump Pop Stars"...which were crude drawings of popular celebrities as Garbage Pail Kids. Garbage Pail Kids were till going strong in late 1987, which prompted CRACKED to re-visit the idea. 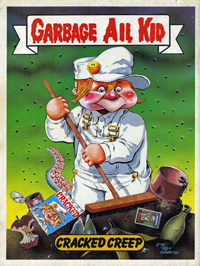 The back cover of Issue #232 (released in November 1987) featured the CRACKED janitor Sylvester P. Smythe as a "Garbage Ail Kid".